When your child is ill, please contact the school to let us know he or she won’t be attending that day. It is important to remember that schools are required to exclude students with certain illnesses from school for periods of time as identified in state rules. 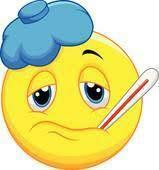 24 hours without use of fever-reducing medications. 24 hours without use of diarrhea suppressing medications. 24 hours has passed with no episodes of vomiting.